THE Philippines government has been put on notice to ban its fishing companies from operating in PNG waters says Minister for Trade Commerce and Industry Richard Maru. Mr Maru said this following his recent visit with the Minister for Foreign Affairs Rimbink Pato to Peru during the APEC ministerial talks. He said he took the opportunity to put the Philippines Government that as a policy, PNG will not in future allow any fishing companies from there to operate in PNG. Mr Maru said they will not take on processed tuna or other marine products from PNG including supplying tuna to canneries in the Philippines. "We are going to now change the policy so no one will be allowed to take unprocessed fish into the Philippines or any other country for that matter so I have given notice that this is going to happen in future when we build the marine park. "The policy will change and this is something that the Philippines government or any other companies must prepare for in this business sector. Prepare for the time that we will no longer allow fishing boats from other countries to bring our unprocessed fish offshore," he said. He said this is because both countries were now competing for the same European Market without paying duty and under identical concessions. "The PNG government wants fish caught in PNG to be processed in PNG for export. There has to be a two way trade between our two countries. "The issue of two way trade has to be discussed and we must look at the trade agreement between our two countries, a bilateral trade agreement that takes into account benefits that their country is getting from our country in terms of employment, business and raw materials that is leaving our country," he said. 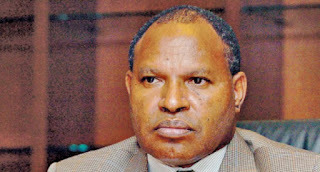 Mr Maru said the Philippines government should look at a partnership with PNG that will allows PNG to also benefit from trading and economic relationship because at the moment its a one sided affair and an aspect that PNG needs to look at.